Calculating hardenability of steels is a common concern when welding steel, because we need to have an easy way to predict and express the hardenability of the steel. Typically, the harder the steel is once welded, the more brittle and susceptible to hydrogen assisted cold cracking it will be. The go-to method of doing this is to calculate the Carbon Equivalent (CE) of the steel. Before we get down to the nuts and bolts of the calculation, let us first look at the thinking behind what a carbon equivalent is. The idea is that the more carbon a steel contains, the more easily it becomes hard due to phase transformations brought on by thermal cycling. So, if we take, say, a 50mm diameter steel ball with 0.2% Carbon, and heat it to say 900°C, and quench it in water, then we would expect it to be relatively hard. If we took a similar steel ball, but with 0.4% Carbon content and subject it to the same procedure, then the steel ball with the 0.4% Carbon will be significantly harder than the ball with 0.2% Carbon. As Carbon is the most common alloying element in steel that results in this hardening effect, it makes sense to try to express this ability to harden in terms of the Carbon content. 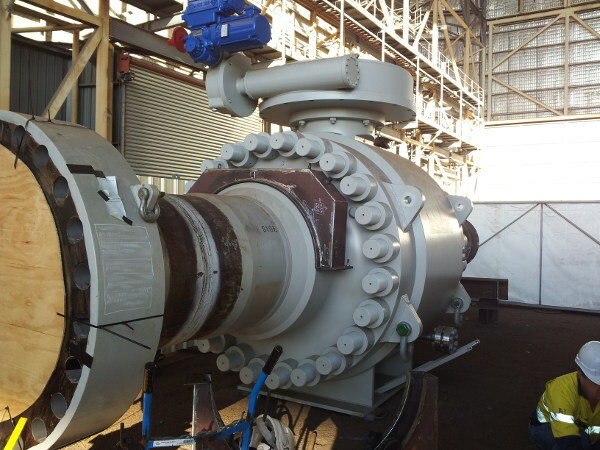 Before welding this large bore gas pipeline valve, you would want to calculate the hardenability of the materials involved. The thing is that other common alloying elements also lead to this hardening effect. Some to a lesser degree than Carbon, and some to a greater degree than Carbon. Some clever people have then expressed the ability of different alloying elements to harden steel as the equivalent if it was replaced by Carbon. This is what a Carbon Equivalent formula is. You will notice that the second equation uses “Pcm” rather than CE. Apparently it is short for “critical metal parameter”. At any rate, the idea is pretty much the same as for the first CE formula. It is a way to compare different steels in their propensity to harden. Please note that you cannot interchange the results of the calculation from the two equations given above, when comparing different steels. There are a number of different equations for calculating hardenability of steels, that provide similar information to the two listed above, but it would not add much value to list them all here. As a general rule, when standards or codes refer to a CE value, they will also provide you with the relevant equation to use, to do the calculation. There is therefore no great need to memorize these equations. Just understand their intent and how to use them. There are many carbon equivalent calculators available on the internet, so you can certainly use one of those when you want to do the calculations. Please just make sure that the equation they use is the correct one for your application. I have just set up a very simple spreadsheet to do these calculations, because then I know exactly which equations have been used. You can certainly download my Excel spreadsheet for doing these calculations by clicking here. One of the main reasons for calculating hardenability of steels, is to estimate how likely a steel is to experience hydrogen cracking. To find out more about hydrogen cracking during welding and how to prevent it, click here.